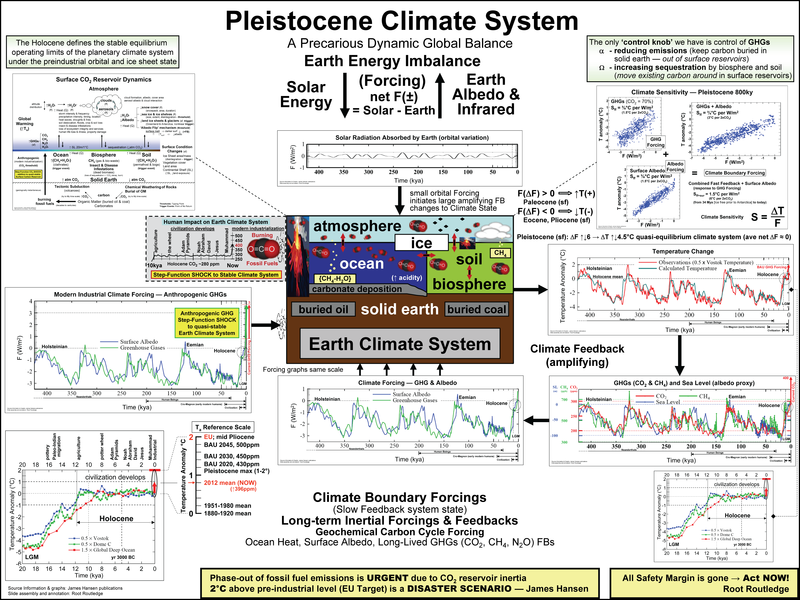 FREE POSTER and DETAILED IMAGES about CLIMATE — please enjoy! This page reads best with browser window size maximized. Copyright and Intent: ©2013 Root Routledge — all posters and images: permission granted to download, copy, print and freely distribute; not for sale or resale. 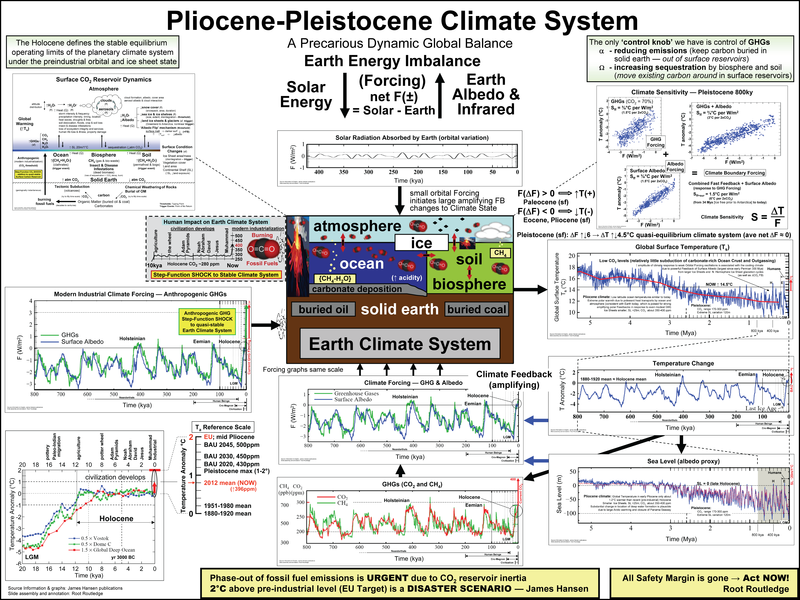 My point is to share this work widely at no cost (other than your printing cost), to help everyone interested better understand our Mother Earth and how our climate system evolved and operates — and to motivate interest for active citizen engagement with climate policy to save our precious Blue Marble planet from its current business-as-usual (BAU) path to certain climate catastrophe. You can download jpg's and have them printed at your favorite locally-owned printing service. For your convenience, I've set up all jpg poster files with our local printer Basin Printing in Durango, Colorado. They can print all the sizes and ship them anywhere in the world. See the file list, pricing and contact information at the bottom of this page. Basin Printing is a printing service company and has nothing to do with the content of the posters. 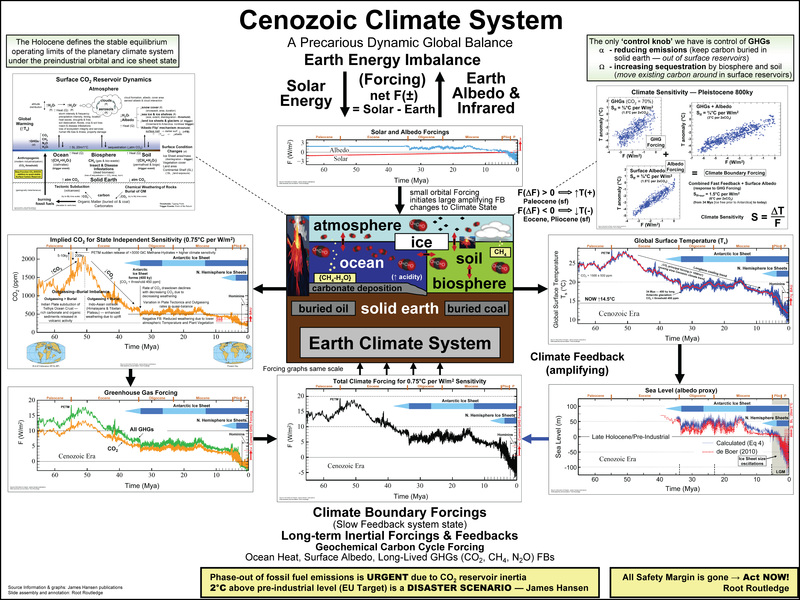 Educational Purpose: As a scientifically educated systems engineer and teacher, I have taken current climate research results and laid out the complex "Earth Climate System" knowledge visually in the context of the evolution of planet Earth, including geologic timescales of eras, epochs and events, with concurrent plate tectonic states and species evolution annotated and illustrated. 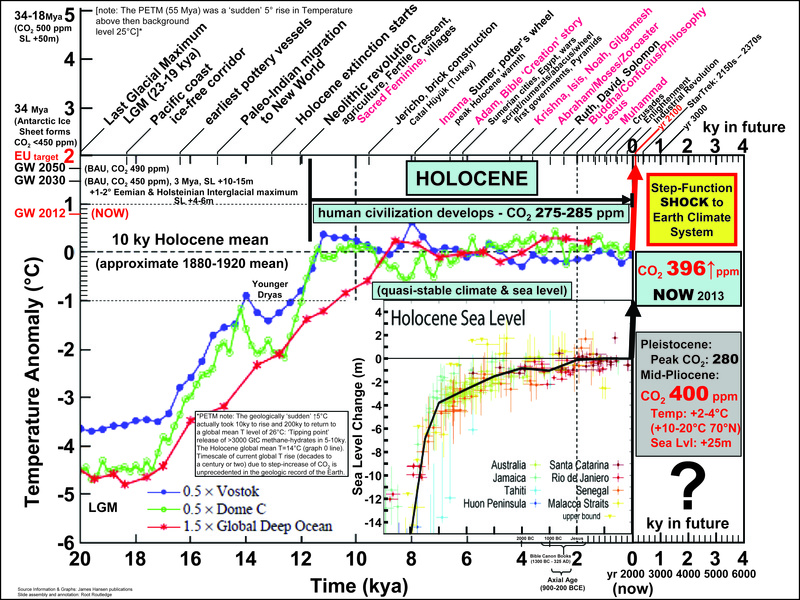 The only way to properly understand climate and climate-change is to understand Earth's Deep Time context of climate. 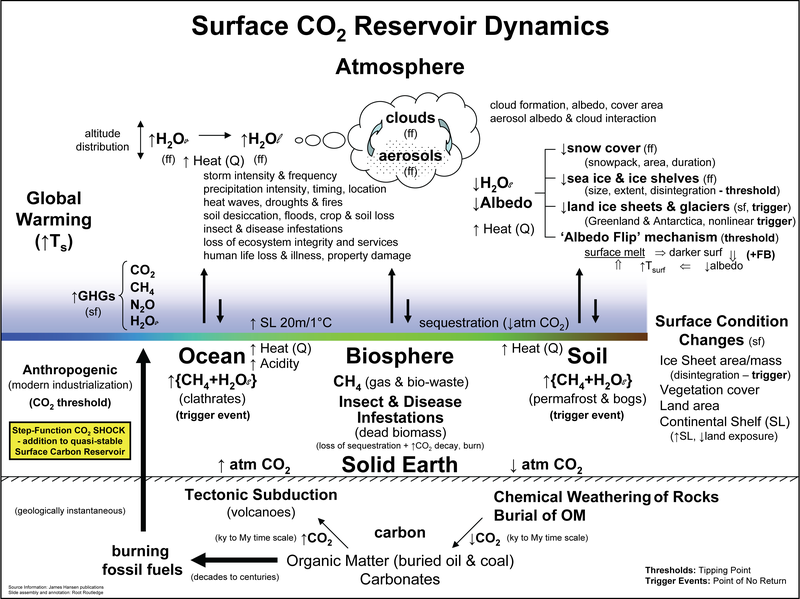 That is because Earth responds to immediate changes with large-scale inertial time lags over immense periods of time; and the carbon-based fossil fuels we are burning up in a geological instant of time have been produced and, until now, remained buried (out of the surface carbon reservoirs of the atmosphere, ocean, soil and biosphere) over tens to hundreds of millions of years. 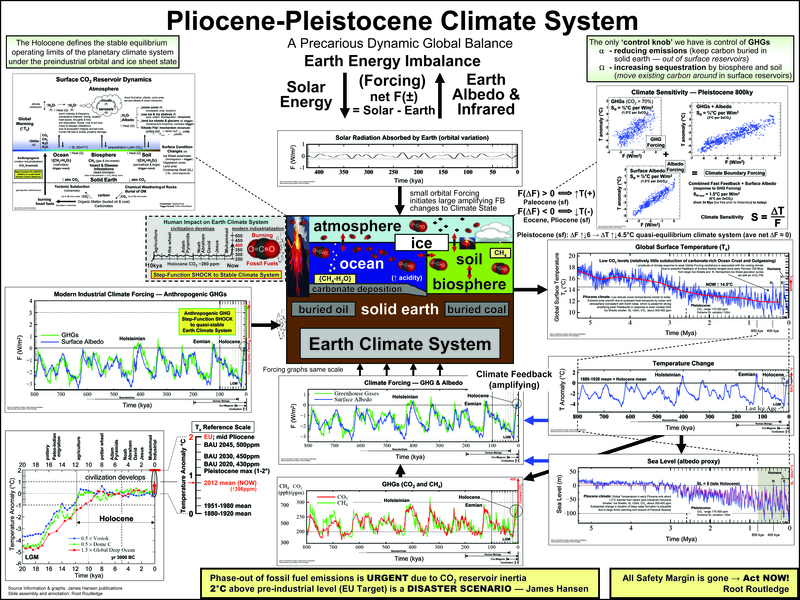 There is no parallel short-timescale event in the entire geological record of the Earth to which we can compare. 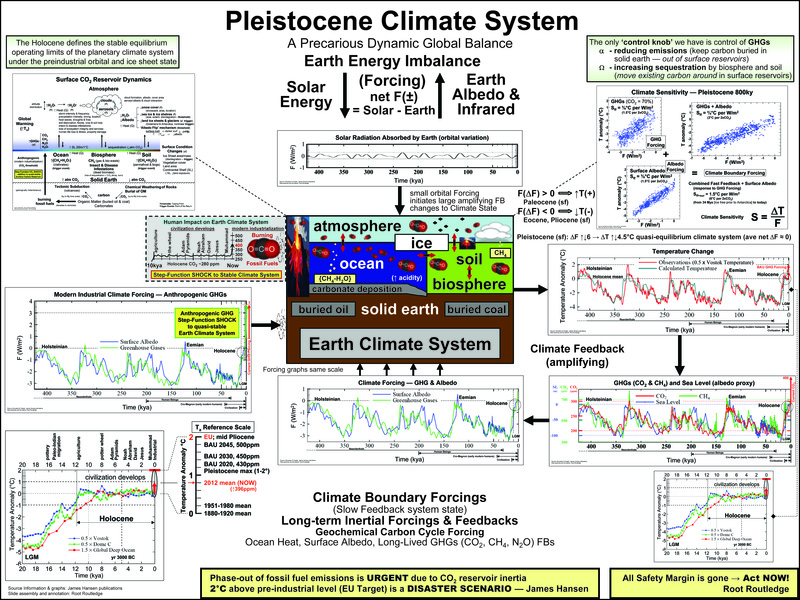 The poster and all content are technically accurate, using technical geological and climate terminology and units from the scientific literature; but I have endeavored to make all of it understandable at some level to persons with some high school science, especially the ability to read scientific graphs [start with the graph titles and axis titles and scales to see what is being related to what; then any annotations that explain what is going on with the paleoclimate data relationships illustrated by the graph and their interpretation]. In order to communicate effectively and consistently about climate change and its policy implications in terms of scales, limits, responses and impacts, we need to use and share a common scientific language and globally standard units (e.g. metric, without continually pacifying ignorance by muddling the picture with other equivalent, yet superfluous numbers in our common American usage of 'English units'). It's a discovery process; what everyone should learn. 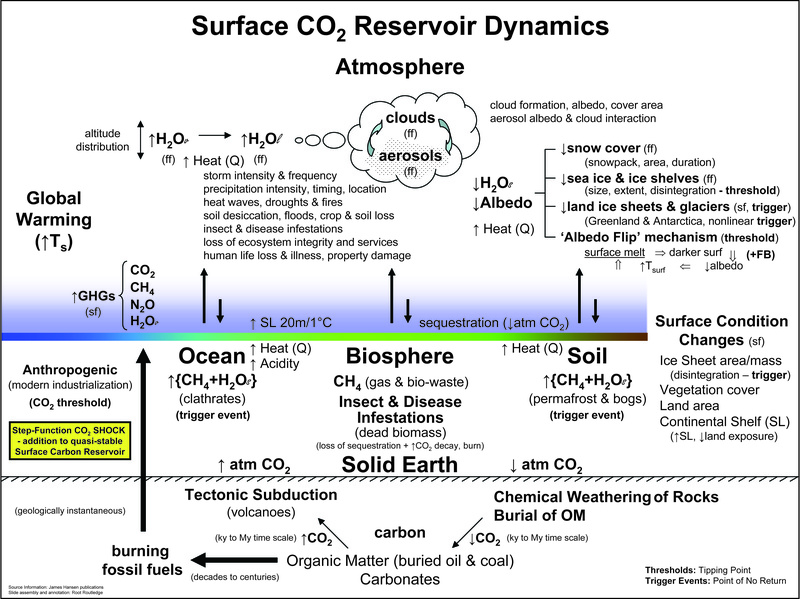 Even kids can start with the pictures, then notions of 'big' time, then temperature graphs... and on through the grades deeper into the college level basic science upon which climate research is founded. Like anything, the deeper your background, the deeper your understanding will be. The more you keep returning to it and study it, the more you'll learn of the embedded stories. Dig into it, stare at it, think about it, meditate on it; enjoy discussing and learning it with others; teach it and share it with others. Use it in the classroom. 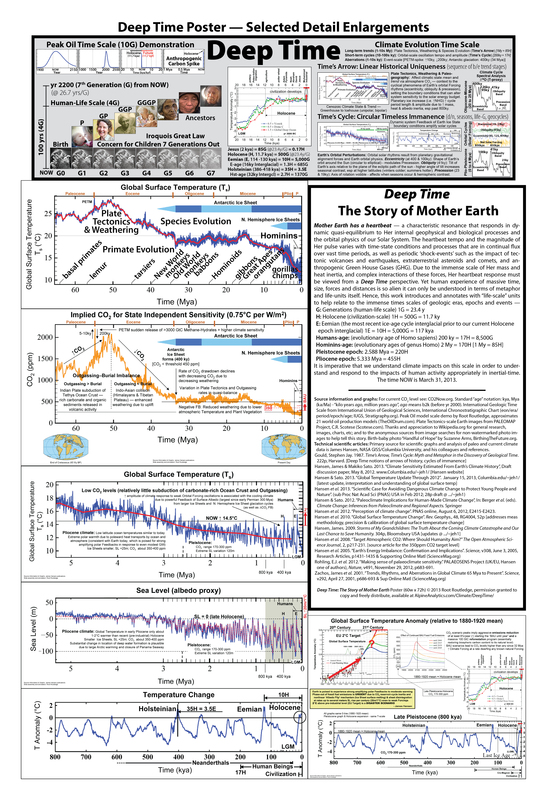 The poster is full, thorough (to this level of detail), and current; and it is based on the best science available (key source citations are on the poster). 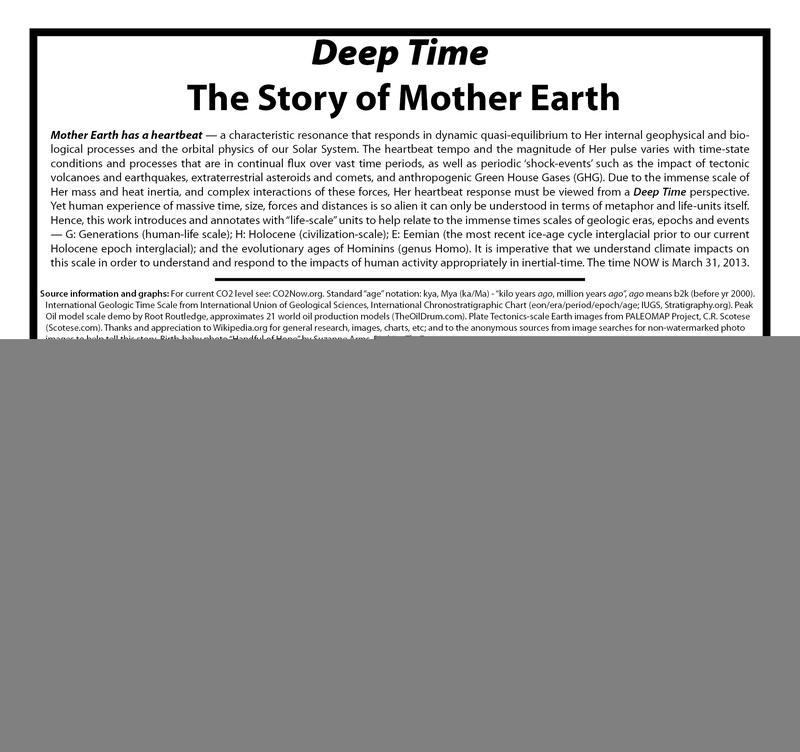 Beyond the large amount of detailed information it contains, as a poster presentation it helps you step back from linear presentation of information and see the big picture and interconnections in a single field of view; and relate to this concept of Deep Time, which is so alien to our human experience. 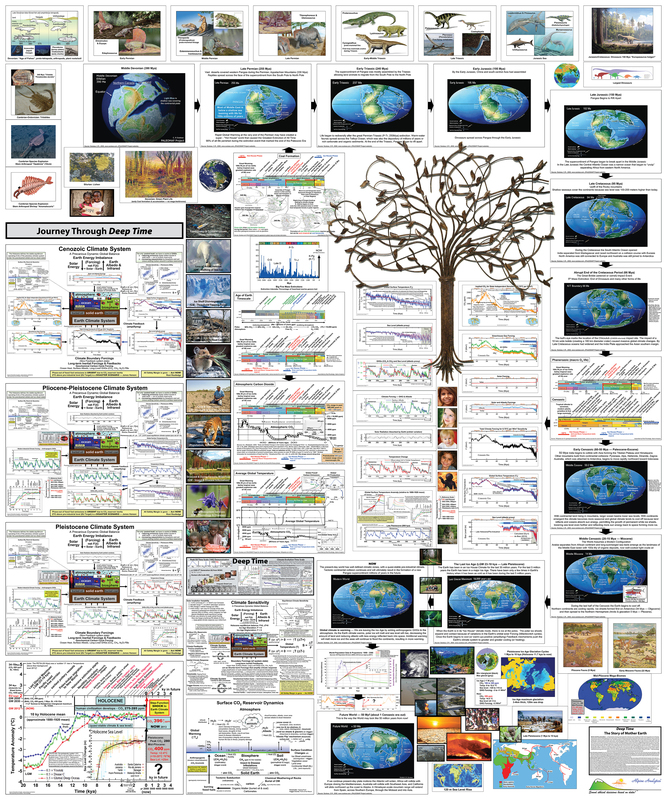 The more hours you spend studying this poster, in little chunks whenever time is available, the more you'll grow to understand our planet Earth. It's not a one-time look-over kind of experience; it should draw you in deeper and deeper. Keep returning to it and ponder the implications for 'climate-as-a-system' and what we are doing to it. Of course, you can go to any of the publications for narrative descriptions, from which the poster was made. 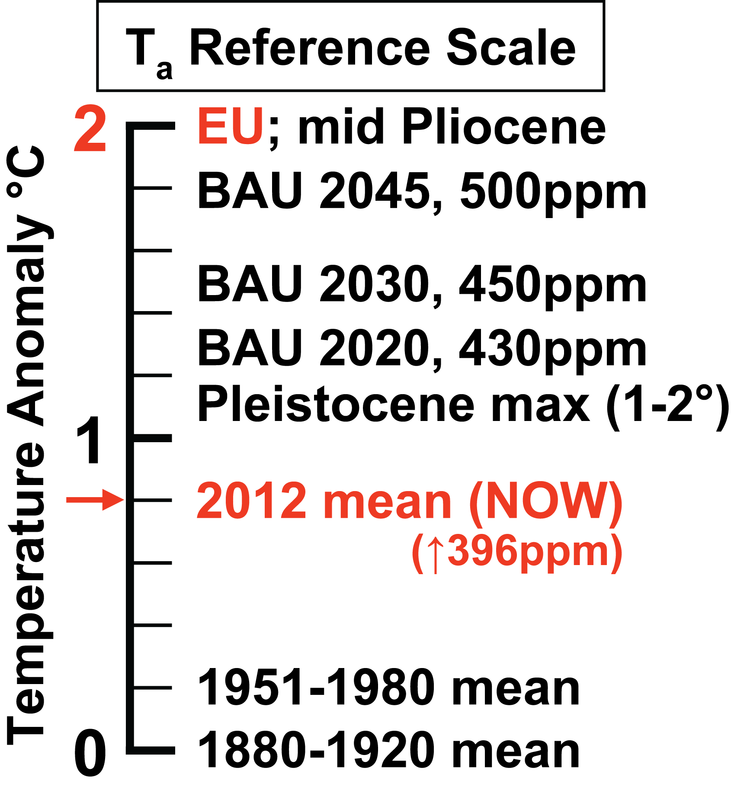 The Earth Climate System is incredibly complex, but overall it can be conceived as a system that responds over long time periods to the Solar-Earth energy imbalance and Earth geophysical 'Forcings,' that in turn produces a global average surface temperature response curve (Ts), or expressed as a temperature anomaly (deviation, Ta) from an indicated baseline (the pre-industrial proxy of the 1880-1920 mean global surface temperature). 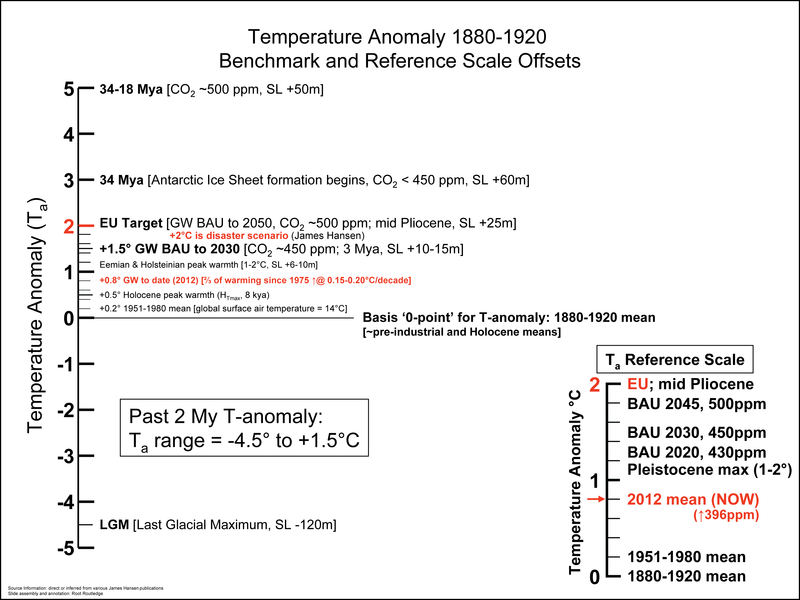 The end temperature response reflects the climate system's temperature sensitivity not only to Solar Forcing, but to complex internal Feedback mechanisms with lengthy time lags due to the immense mass and heat inertia of the Earth. 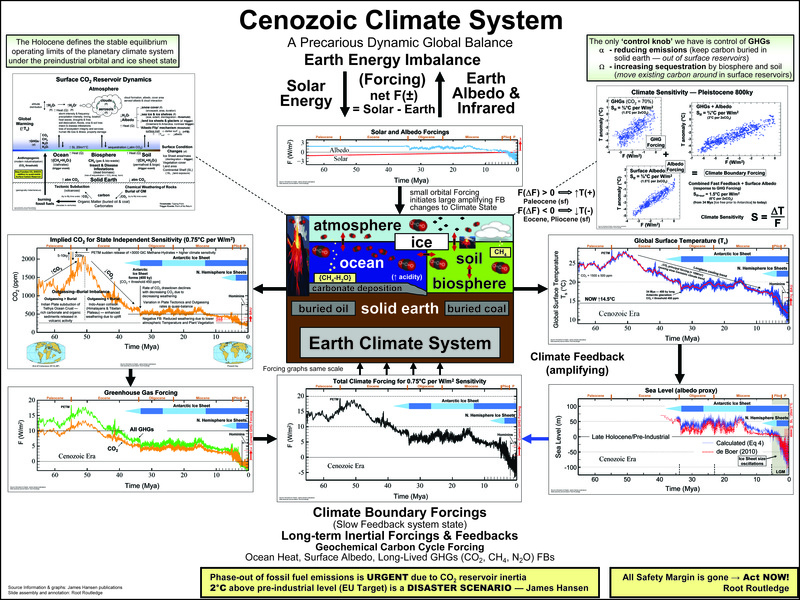 There are two primary internal Feedback factors responding to the Solar-Earth energy imbalance: Green House Gases (GHG, dominantly CO2) which affect how much absorbed heat energy the Earth is able to radiate back out to space; and the Earth's Albedo reflection of Solar energy, thus not absorbed by the Earth. Albedo is dominated by how much Ice is on the Earth at any point in time (Antarctic & Greenland Ice Sheets, Arctic and Shelf Sea Ice, and the size of Glaciers — collectively represented over geologic time by the proxy measure of Sea Level, SL). Minor changes in the Solar imbalance Forcing get amplified by these intermediate 'positive' Feedback response factors, producing even greater Forcing-changes in the temperature response curves. These are the relationships that are laid out in system-diagram fashion, with the various curves illustrating the magnitude and timing of the characteristic response over the noted time periods. 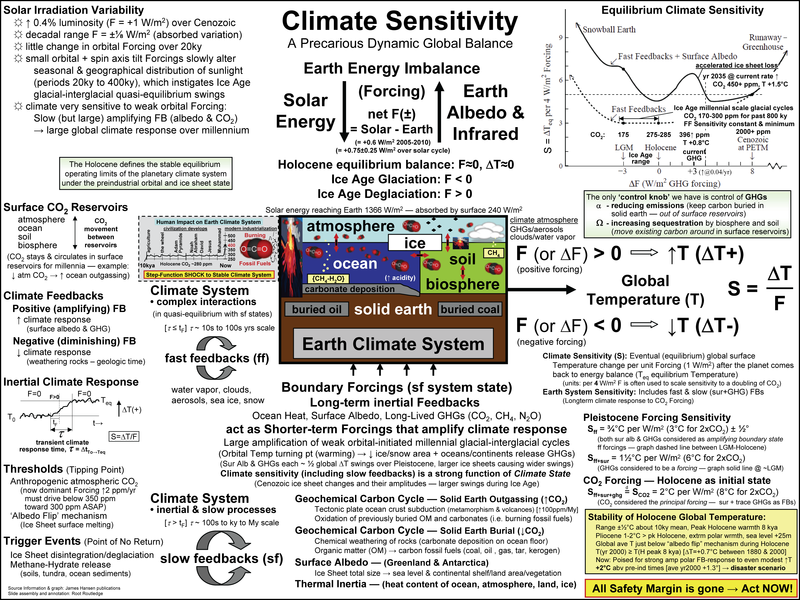 Detailed system dynamics explanations are laid out in the "Climate Sensitivity" graphic. Dominant Ideology and Moral Implications: When an unwelcome message with profound implications is heralded, entrenched interests like neither the message nor the messenger, whom they endeavor to reject, ignore, ridicule, diminish or discredit... even when that flies in the face of a desire to religiously celebrate the arrival of the messenger. But that does not alter truthful facts of the message; nor does it change who the messenger is. With respect to powerfully entrenched ideological beliefs that are challenged by the message, Albert Einstein said: "The problems that exist in the world today cannot be solved with the same thinking we used when we created them... Man should look for what is, and not for what he thinks should be... Insanity is doing the same thing over and over again and expecting different results." What moral obligation do we have today toward the future generations of our species and the rest of planetary life — indeed, to enduring quasi-equilibrium planetary stability? Is it just to our own lifetime of 'self' and accumulative material status, which our present economic system and culture focus on by default through the commodification of life and the human spirit? To our own children and theirs and theirs until that generation far enough out who we'll never know as their ancestors? Just to human beings; or inclusive of the intrinsic value of all life? Seven generations out? More? How far out should we be concerned about the condition and trajectory of the planet we bequeath to future generations, who will one day ask: who were those people of the Industrial Age? Our knowledge of the Earth is now vast and growing; we know of its processes, structures, mechanisms and rhythms; and that we can alter them irrevocably or even destroy them. Is it okay to ignore this knowledge for the sake of serving our current poorly designed social construct called 'capitalism' (maximizing monetary returns, power and control to the few with the most capital; not to be confused with democracy and true market economies)... To serve a socioeconomic system that by design systemically discounts people, spirit, society, our environment, wildlife, wilderness and the future? All of it in order to 'enjoy it all now while it lasts' — even in blind ignorance without malevolent intent to see others now or in the future experience the resultant pain, distress and suffering from our profligate ways... But while doing so leave the continuance of our planetary life damned on a trajectory into a future hell of chaos, suffering, destruction and, with eventual certainty, an unfathomable condition of Iceless-Earth, by digging up and burning 100s of millions of years of buried carbon to extract its momentary monetary value for the corporate few, all in a geological instant in time? The vacuous and simplistic counter arguments boil down to this: We need to grow the economy and feed the growth's energy demands. Period. End of argument... As if the purpose of human existence is to 'serve the economy' that is a construct of our making. Winston Churchill once famously said: "We shape our buildings, and afterwards our buildings shape us," described by modern-day philosopher of technology and contemporary life Albert Borgmann as "Churchill's Principle" (Real American Ethics: Taking Responsibility for Our Country). If we don't step back from our current system and examine it anew, we are doomed to simply serve it in a mindless fashion, oblivious to where it is taking us and our planet. 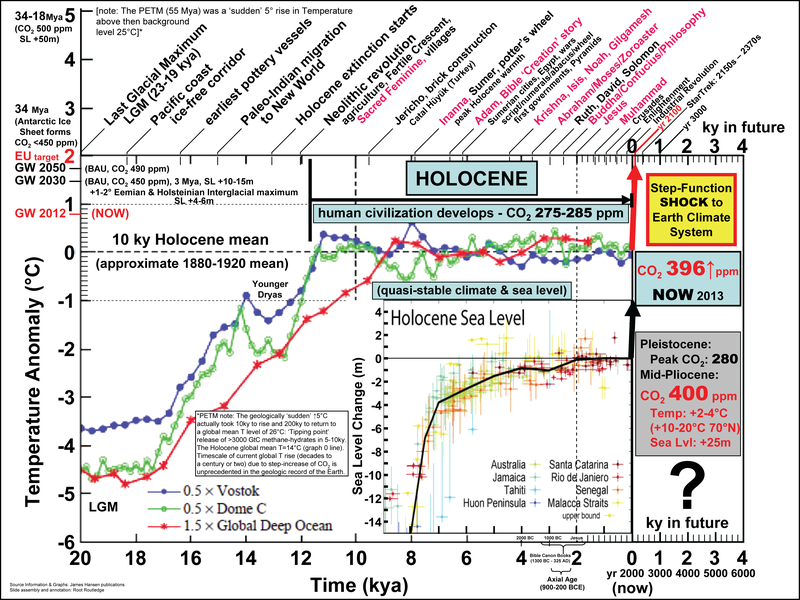 To take the implication of these questions seriously, we must ascent to an obligation at least the length of time into the future that it took for what we call 'civilization' to develop — one full Holocene out. 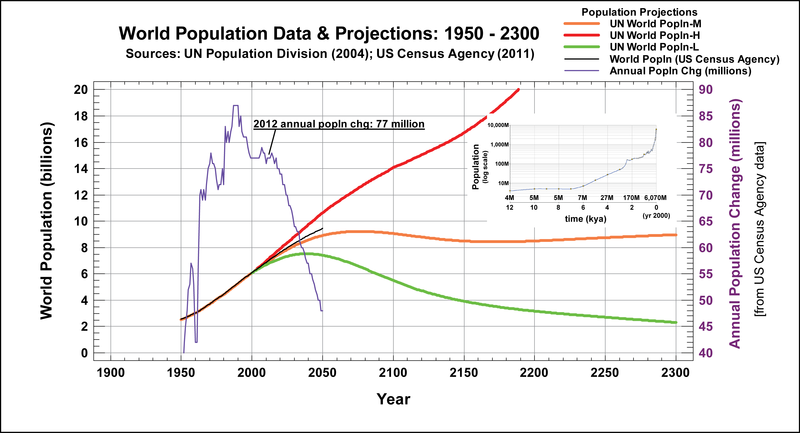 The end of this century, 2100, seems a long way out in our discussions and projections; but that's only because our time perspective is that of a human life. In reality, it's a brief flicker of time; only on the civilization-scale will we contemplate inertial trajectories we set in place now that will manifest over the coming centuries and millennia. Even this amount of time (500 Generations) is miniscule relative to the natural rhythms of the planet and the GHG shock we are imposing on the Earth Climate System. 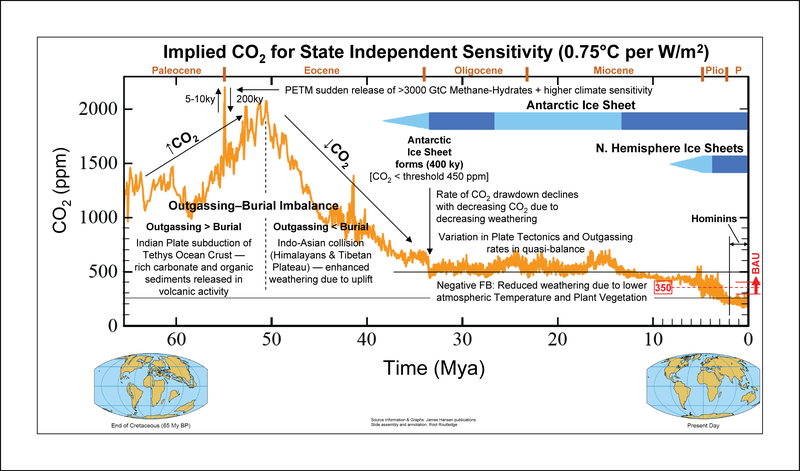 This GHG shock actually may hammer a final stake into the 'heartbeat-rhythm' of Mother Earth as this carbon-spike disrupts and destabilizes a naturally functioning ice-based system in quasi-equilibrium for millions of years. Yet rather than face this reality, we seem intent to ignore the risks and 'double down' on the stakes of our future, until one day we will be beyond the point of possible recovery from the hazards of climate change. Indeed, if we know we can destroy it, we have a moral obligation to ensure we don't — ignorance is no longer an excuse, if it ever was. If we are uncertain, we have a moral obligation to err on the side of safety — to apply and live by the precautionary principle. 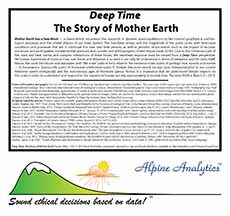 A wider more virtuous sense of timeless human dignity that encompasses all human beings and life, and a sense of religion-transcendent human spirituality, demands we understand and care about our Earth's trajectory... not merely the state and condition of our planet during our lifetime. 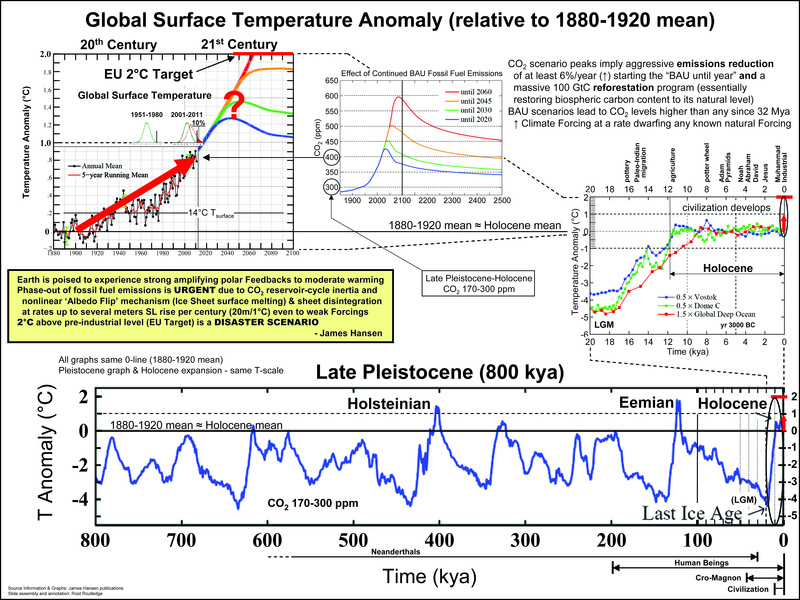 It's all at risk due to the CO2 "shock" from the burning of fossil fuels buried 100s Mya — literally in a geological instant in time, as you will learn. 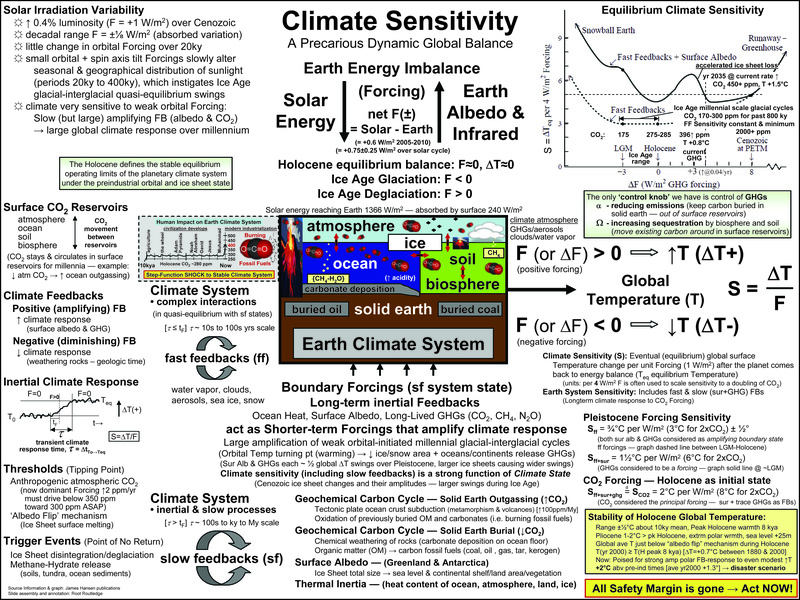 Full Poster Download: This wall poster was designed for readability at full size (60"w x 72"h) — best for viewing everything. Excellent for school wall, large poster board, or room or hall wall in an organization... or that big empty wall at home! Works very well for home wall, office wall, or classroom wall. Most poster print is still crisp and legible (300ppi), but some places smaller print and detail is too small to read easily, so selected detail is enlarged as the accompanying 13x19 poster at right. It is supplemental and incomplete by itself, so only should go with the half-size full poster; the full poster is what tells the story. This companion poster is a collected group of "too small to read" poster images from the full poster, designed to go with the half-size (30x36 poster) as a set. It is the full complete poster (half-size), however, that tells the story. This is just detail images in larger format for readability. They go great side-by-side as a set. These individual expanded images can also accompany the half-size or small-size poster on your wall for text-size readability, if needed. They are also useful as individual graphics for the wall (16x12); or as color handouts (11x8.5). The individual side graphics are all legible if printed 11x8.5 letter size. Largest more complex are 16"x12" and print nicely on standard 19"x13" paper (printed at max printable size with a ½" or less border). Click on side graphics for individual jpg downloads (images themselves are linked to the larger size). right click after its started to load then "Save Image As" at the start; or if not loading properly "View Image Info (Media) ", then save it (this method works okay in FireFox... other browsers? ...you'll have to figure it out). The full poster image below is linked to this download size. Hardcopy posters (all sizes) are printed from the large 300ppi jpg files and can be packaged and shipped anywhere in the world; prices are for printing (add Durango sales tax and shipping costs). Large posters (60x72 and 30x36) are printed with a large-scale HP printer on white satin role-paper (235g, approximately same as 80# thickness). All 19x13 images are printed on white 100# Endurance Cover Gloss paper.